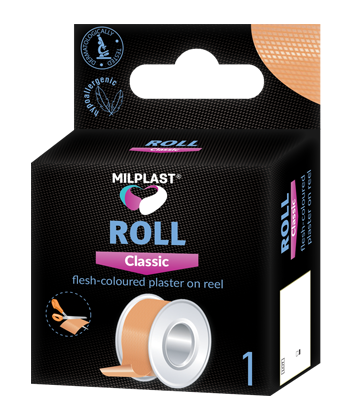 Milplast ROLL Classiс was developed for fixing medication on the wound and is useful for bandaging and dressing. The plaster is produced as cut-off tape and can be easily cut into pieces of desired length or used for continuous dressing fastening.The plaster elasticity allows its application on any skin area. It can be removed easily and painlessly, without remains on the skin.